Urban bicycle sharing systems are successfully introduced in cities all over the world as part of the urban mobility system. The bike sharing world in The Netherlands however shows a very different image. OV-Fiets, which lacks a lot of options the foreign bike sharing schemes have, is the only large scale bicycle sharing scheme in Holland. The reason for this is the reserved attitude of government and private parties concerning bike sharing in Holland. This attitude is caused because a lot of people in Holland own their own bike, which are frequently used in every day traffic. However, the attitude regarding bicycle sharing in The Netherlands changed recently. More and more small scaled bicycle sharing schemes evolved over the last couple of years in the Netherlands, to find out what the effects and the contributions of bicycle sharing systems in the Netherlands could be. The main goal of this investigation is to gain insight into the spatial effects of bicycle sharing systems for Dutch cities. To determine this effects there has been an extensive research into the potential of bicycle sharing systems in Holland. This has been researched by means of deskresearch, an extensive inventory of foreign bicycle sharing systems and expert interviews. It has become clear that the Dutch situation regarding the potential of bike sharing is incomparable with foreign examples of successful bike sharing. The main reason for this is the high number of privately owned bicycles in the Netherlands. The results and effects of bike sharing in other countries can therefore not apply to The Netherlands. This does not mean, however, that there is no potential for Dutch Bike Sharing next to the current OV-Fiets system. The rate of succes of the OV-Fiets indicates that there is a need for a bike on places that the own bicycle is not available. These situations are not limited to the transport from the train station into the city, where OV-Fiets is focused on. Thereby it is plausible that the demand for a shared bike increases when the possibilities to use a OV- Fiets become more flexible. Among other reasons this indicates that the bike sharing potential in The Netherlands reaches further than OV-Fiets, which is targeted to use as transportation from the train station. The high number of privately owned bicycles in the Netherlands will always play a part in the Dutch bike sharing world though. On the basis of the outcomes of the research three promosing future scenarios are drawn up fort he bike sharing future of the Netherlands. Possible effects of urban bike sharing can occur in the field of car usage, public transport usage, cycle parking pressure and the use of public space. The effects that occur and the extent of which they occur depends on the way a bike sharing system is designed and used. In the field of reducing cycle parking pressure by means of shared bikes the second owned bikes are promising. The extent of this effect is difficult to determine, partly because the shared bikes themselves cause parking pressure. Bike sharing could have a major effect on the cycle parking pressure in the Netherlands if residents can be persuaded to use a shared bicycle in their own town. 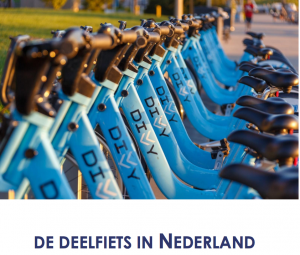 In the promising future scenarios for bike sharing in The Netherlands however it becomes clear that it is unlikely on the short term that the Dutch wil use shared bikes in their hometown on a large scale. In the context of the effects of bike sharing on public transport in the Netherlands the role of the shared bike will be limited as supplement of the existing urban public transport system. For a large group the shared bike could act as an alternative, but for a large group this does not apply. Read the Master Thesis in Dutch here.